In the gemstone trade any non-blue Sapphire is termed "fancy”. And to clear up matters the color denominations are also used, so that when talking about Fancy Sapphires, we talk about yellow, purple, pink, green or white Sapphire, etc. Pink Sapphire belongs to the corundum group which is set apart from other gemstones by their very good hardness (Grade 9 on the Mohs’ scale). They are second in hardness to diamonds only, and diamonds represent the hardest mineral on Earth! Fancy sapphires are the epitome of individualism, the perfect choice for women who love unique colored gemstone jewelry. These Sapphires exist in a charming variety of designs - set in rings, as pendants or earrings, as solitary stones, in elegant line-ups or as sparkling pavée. 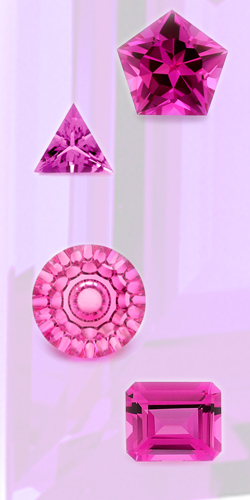 Lab Created Pink Sapphire Gems are available at Andegem.com on a per order basis only. To inquire about pricing, shipping rates or any other information you need about Lab Created Pink Sapphire please email us at sales@andegem.com .